Following the news of her return to cable news, Sarah Palin surprised nobody by appearing on On The Record to voice her support for Donald Trump‘s immigration policies. She began by telling Greta Van Susteren that even though Trump’s plans are not yet complete, she praised him for looking at the big picture, and challenged his competitors to do the same. “When we incentivize people to come on over with any avenue, it sends the wrong message to illegals,” Palin said. “In fact, we are rewarding them taking illegal action as their first step as they are on our land. How much sense does that make? 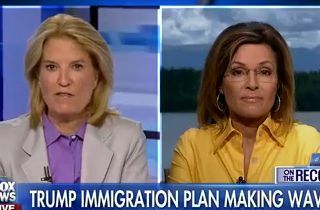 Van Susteren then asked Palin about her opinion about Trump’s proposed idea to revoke birthright citizenship despite the challenge it posed by the 14th Amendment. Palin responded by saying that the notion that the GOP wants to separate kids from their families is a deliberate portrayal of heartlessness. She also expressed confidence that Trump’s inevitable policy proposals will teach children to stay in line and that their family unit will be maintained.